Charles Paulson Ginsburg (IRE A'48, M'55, SM'59) was born on July 27, 1920 in San Francisco. He joined Ampex Corporation in 1952, after serving in various engineering capacities with professional sound services and radio stations in the San Francisco Bay Area. 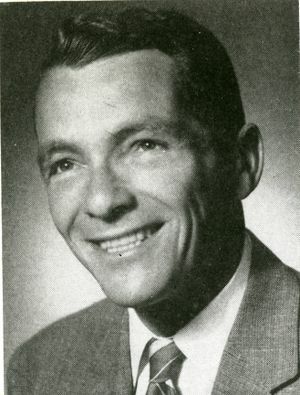 He was graduated in 1948 from San Jose State College, with the B.A. Degree in mathematics. He was named a vice president of Ampex Corporation in 1960, and served as Manager of Advanced Video Development. Ginsburg, who led the development of the Videotape television recorder, has received the coveted "Valdemar Poulsen Gold Medal" from the Danish Academy of Technical Sciences. He is the first native-born American to receive the award, which has been given only six times since its inception in 1939. The Gold Medal was presented to Mr. Ginsburg by Carl Schroder of Copenhagen, vice president of the Danish Academy of Technical Sciences, in special ceremonies on November 23, 1960, in San Francisco, CA. He was cited by the academy for his "guiding spirit and principal participation in the development of the video tape recorder by Ampex Corporation, an outstanding achievement... which is well known to magnetic recording and television engineers all over the world." The academy, which administers the "Valdemar Poulsen Gold Medal Foundation," noted that its decision is supported by the IRE and the Society of Motion Picture and Television Engineers. Mr. Ginsburg received the Gold Medal, officially, November 23, the birthday of Valdemar Poulsen, discoverer of magnetic recording. Ginsburg also received the 1958 IEEE Vladimir K. Zworykin Award "For pioneering contributions to the development of video magnetic recording. ", the 1957 David Sarnoff Gold Medal of the Society of Motion Picture and Television Engineers, and an Academy of Television Arts and Sciences "Emmy" award, for outstanding technical achievement. Ginsburg died on April 9th, 1992. This page was last edited on 15 February 2019, at 15:11.